Questions? Concerns? Want to place this order by phone? The Collected Wisdom and Advice of an International Expert on laboratory quality management. Note: Limited edition. Less than 6 copies remain in print. This will come with an autograph by one of the Westgards and will include the set of 3 Westgard thumb drives. With the help of Dilbert cartoons, Dr. James O. Westgard, Ph.D., outspoken advocate for better quality in healthcare laboratories and creator of the "Westgard Rules", presents a collection of essential writings on quality. These essays, some of them originally published on Westgard Web, cover topics ranging from Six Sigma to Diabetes, Cholesterol to hs-CRP, Enron to Firestone, NCEP to the CLIA Final Rule, ISO uncertainty to Evidence-Based Medicine. Together, they provide you with a broad and in-depth analysis and perspective on current quality management practices and the need for improvements. Taken together, these essays fire a broadside at the conventional wisdom about the state of quality in laboratory testing today. This is a book that must be read by laboratory directors and manager, industry executives and consultants, government regulators and surveyors, and professional accreditors and inspectors. Why scientific studies may be biased by unscientific assumptions about the performance and stability of laboratory testing processes. 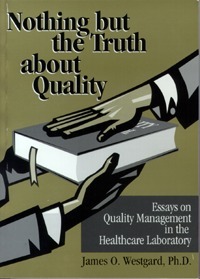 Nothing but the Truth about Quality is the real book on quality management in the healthcare laboratory. Bringing these issues to life and into your life - it goes beyond the formal scientific papers and the glossy instrument brochures to illustrate the importance of quality in everday issues, especially healthcare. Finally, you can get the truth about quality.